In Estonia, I never had a bad meal. Yet two restaurants stood out, tying for first place in my little, foodie heart. Both Neh and Ribe showcased refined versions of Baltic and Scandinavian cuisine that would make any pioneer of the “eat local” movement proud. My first experience with with Estonian cuisine almost immediately after arriving in Tallinn, happened to be Neh. What a introduction! Comparing Neh’s menu with traditional Estonian cuisine is kind of a stretch, like describing in the same sentence both a meal at 2014’s “It” Washington restaurant, Rose’s Luxury (A. MAZE. ING. Bon Appetit certainly thinks so) and one of my grandmother’s all-American pot roast meals as representative of the United States. Housed in a small, blink-and-you’ll-miss-it 19th century building that formerly housed ship workers and tucked between ferry ports and a strip mall, Neh was almost literally a hidden gem. The entire experience was best described as “sublime” by one of my dining companions. The flavors were subtle and perfectly balanced. Souz chef Maido Maiste and his two kitchen kolleegidega worked diligently as a three-man team to serve the entire restaurant (photo below). Their presentation was consistently both immaculate and rustic; for instance, dessert was served in a simulated hollowed log. It was so wonderful that we returned for a full 3 1/2 course meal a few weeks later. 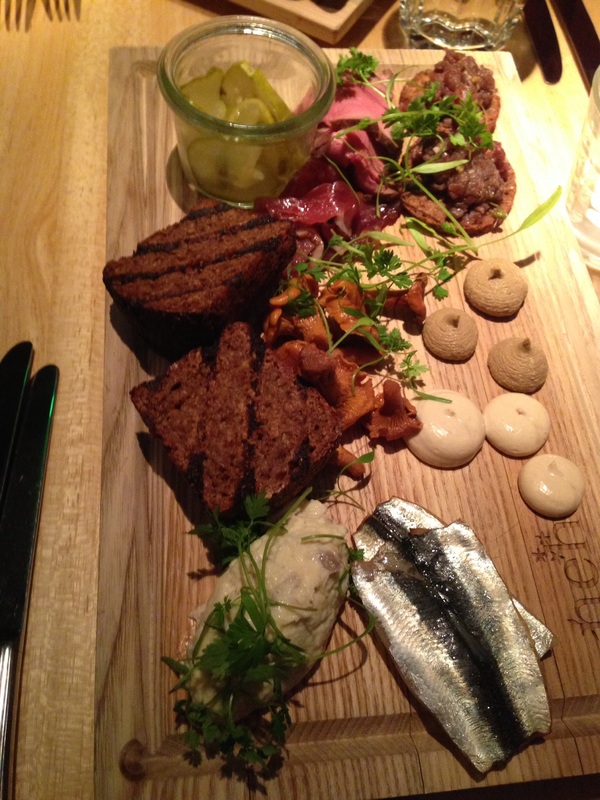 Don’t miss the Made in Muhu starter. Clockwise from top right: beef tartare on black bread crisps, chicken liver mousse, chanterelle cream, smoked herring, cod foam, toasted juniper black bread, homemade pickles, and duck prosciutto. On both visits, we could not pass up the Made in Muhu (Muhu is an Estonian island) starter boards. These platters transformed local ingredients into stars: beef tartare bites on black bread crisps, duck prosciutto, herring, cod foam, and teardrops of chicken liver pate and chanterelle cream. The chanterelle cream had a wonderfully intense mushroom flavor, so rich and velvety that I stole a bit of it from other platters at my table – both times. Cepe soup ready to go out to a large party. On the second visit, I finally was able to try a cepe (mushroom) soup with a vegetarian caviar and creme fraiche that I’d drooled over when touring their kitchen at the end of the first visit. It was as good as it looked, and it inspired me to recreate my own rendition of this soup when I returned. Learn how to do it yourself in my next post! Every entree was presented so photogenically, and the flavors did not disappoint. My entree on my first visit was listed in English as a “nice piece of beef.” That was the biggest menu understatement I’ve seen in, maybe…ever. But that sort of humility was one of the things I really enjoyed about the Estonian people. Expect little and you’ll be blown away. Neh’s beef tenderloin medallions, cooked to medium-rare perfection were indescribably tender and flavorful, complemented by a jus accented with four representatives of the onion family: roasted leek, sweet caramelized onions, blanched single pearl onion, and a roasted red onion. Simple and yet so amazing. Having chosen a vegetarian tasting menu on the second visit, my meatless barley risotto with squash and chanterelles was so hearty and yet elegant that even carnivores would have a hard time noticing the absence of meat (pictured at the top of the page). I don’t count Spain as one of my favorite countries for wine (sorry! ), but Neh’s recommended white (Albarino) and red (Rioja) both were outstanding and paired well with every starter and savory course we tried. Neh made me re-think my opinion of Spanish wine. Who’d have thought Estonia would be responsible for that? (I should have expected that later, a little Italian wine bar in Vilnius, Lithuania would do for Italian wines what Neh did for Spain). Black currant mousse with tuille…amazing. Equally understated as the other courses, the dessert flavors subtly wowed us. From small jars of our apple cobbler “pre-dessert,” to a tart prune cake paired with delicately sweetened buttermilk and cardamom ice creams, to otherworldly black currant mousse topped with an oversized, tart and buttery blackcurrant tuille, and to a gooseberry mousse (gooseberries look much like green grapes) so light that nobody could pass it up even after such a large meal. Ok, did these dishes make you want to book flights to Tallinn immediately? Writing it made me miss it and one of the restaurants that wowed with understated, uncomplicated elegance. 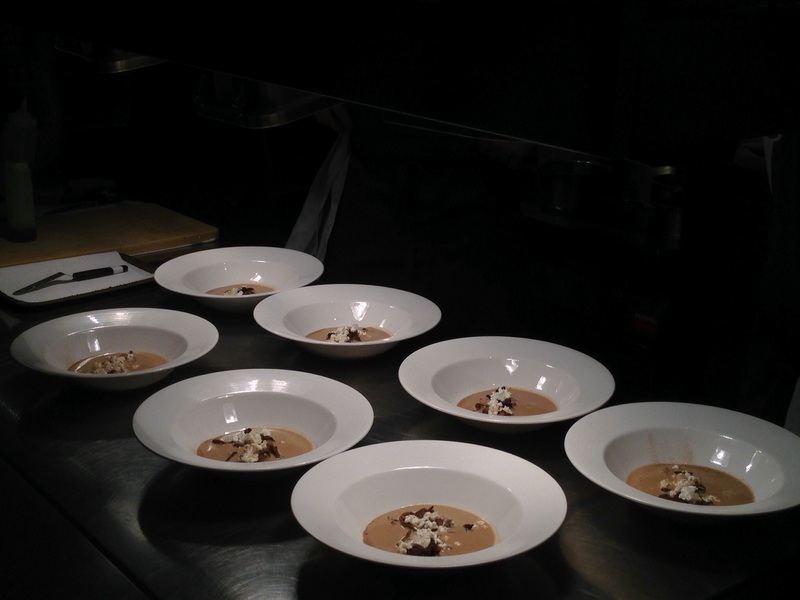 Stay tuned for more profiles of outstanding restaurants in Tallinn and the other Baltic capitals. Previous Post What is Baltic cuisine?